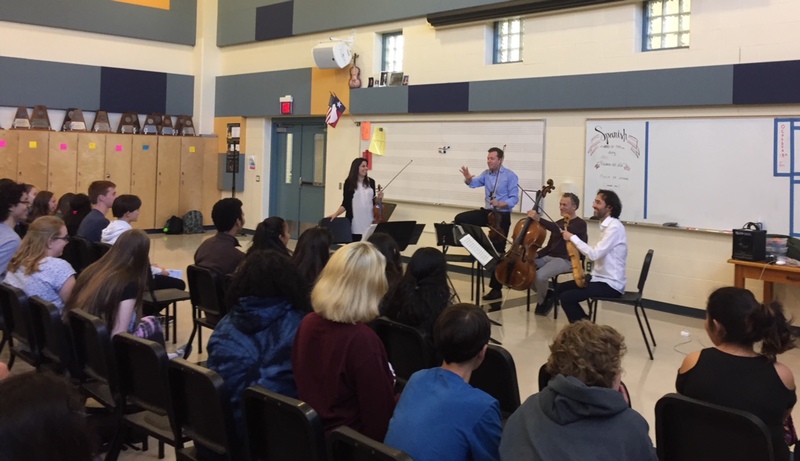 On the Monday after their performance with Sharon Isbin, the Pacifica String Quartet gave an amazing workshop for about 140 string students at Alamo Heights High School. The program was about string quartet repertoire and how players prepare to perform. The players performed several sections from the Sunday concert. They showed the relationship between the Haydn quartet and works by J.S. Bach and popular dance movements like the minuet. Next, they played a movement of a Russian quartet by Beethoven to demonstrate a fugue, which requires that the players ‘converse’ musically with one another. During a very interesting question and answer session, the students asked quite insightful questions about the musicians’ instruments and their history. The quartet continued with some Shostakovich, since they had heard from the orchestra teacher that the advanced students were working on the composer’s 8th string quartet. They concluded with some of the Puccini quartet from the Sunday performance. The San Antonio Chamber Music Society had an embarrassment of riches when we had both the Pacifica String Quartet and world-renowned guitarist, Sharon Isbin in town to do Outreach Events for us. Following their beautiful performance on our Sunday series, both the quartet members and Ms. Isbin shared their talents with some lucky students. Sharon went to the KIPP (Knowledge Is Power Program) public charter school of San Antonio. The school was having a teachers’ work day, but students were invited to attend school anyway to hear a guitar concert. One boy who studies guitar, walked four miles to get to the concert. He said he didn’t have a ride or money for the bus, but he wasn’t going to miss it. Sharon sat in the modest classroom amid hundreds of musical instruments lined up neatly in cases to be used for teaching. The classroom was obviously cared for meticulously by music teacher, Elena Magallanes. Sharon entertained us all with stories about her White House and Ground Zero performances among many others. She played Asturias by Albéniz and Recuerdos De La Alhambra by Tárrega, two of the most beloved guitar works while we sat entranced and enthralled to watch and hear her intensely beautiful and moving playing up close. 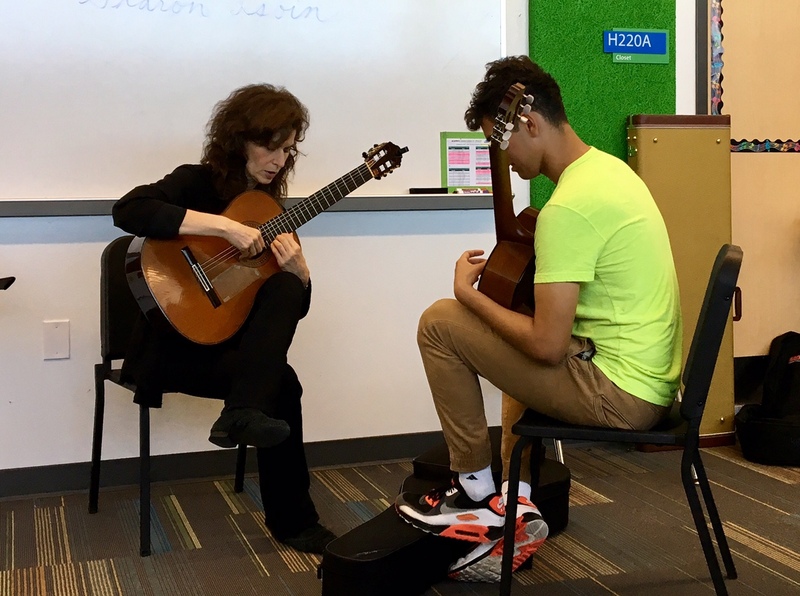 Near the end of the event, the teacher asked the student, Enrique Villarreal, if he would like to play for Sharon and he responded enthusiastically. Ms. Magallanes opened one of the guitar cases and handed him an instrument. He played a few scales and had a “private lesson” with the maestra!